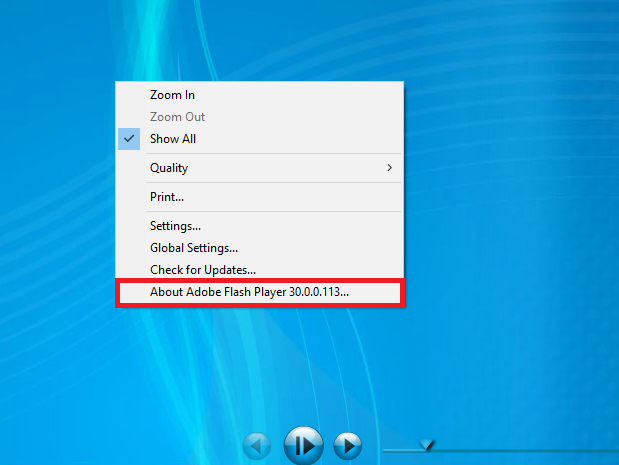 On July 25, 2017, Adobe announced that they will stop updating and distributing the Flash Player at the end of 2020. This was over a year ago – and yet not many in the elearning industry have made moves to get ready for the end of this commonly used format. Flash courses, or any course with even small Flash elements, will all have to be converted to another format to be usable. The updated format that many people are turning to is HTML5, which still allows same the interactivity and flexibility that Flash was revered for. Converting courses to a format that doesn’t require a flash player can be timely and expensive, so it’s best to start the process as soon as possible. This blog will go over what you need to know to make a game plan for a smooth transition into the HTML5 world. Why is Adobe Pulling the Plug on Flash? Flash is one of the most impactful things to happen to the internet. Many people who grew up with computers first used the internet via Flash, playing Flash games online or using the famously tacky Flash websites that plagued the 90s. Unfortunately, issues related to security, accessibility, and load time have plagued Flash for years and many companies and industries have moved on. Apple boldly banned Flash from the iPhone when the device was initially created, and in 2010 released a formal letter explaining their reasons. Ever since, the popularity of Flash has slowly waned. By now, only 17% of computers have the Flash Player downloaded. If you see this, it’s a sign you need to put a conversion game plan together as soon as possible. What are Your Options for Saving Your Flash Content? Your options for saving your content can vary depending on content needs. Some content is more complex than others. A slideshow-style module with little Flash-based interaction might be very simple to turn into a different file type. But more complex modules that were built almost entirely using Flash will require either a part or entire new build in order to make the course function the way the old one did. Additionally, many companies are choosing to take this conversion as an opportunity to update the content itself. Keep in mind that conversion is a difficult process. It’s strongly recommended that experienced instructional design professionals undertake it, and if you don’t have in-house designers you can rely on, consider outsourcing the project. Attempting this without prior knowledge or experience may result in a waste of time and money for all parties involves. Not every tool or process will be able to provide what you need, and consulting an expert who knows ensures that the conversion will be successful. Converting the Content: Converting the content involves taking the very same content and replicating it in an HTML5 authoring tool. This option is probably the simplest and least time-consuming way to survive the death of Flash. Keep in mind, this is only possible if you have access to all the original graphics, videos, and other files that were used to develop the original Flash course content. Hopefully you kept organized in the original production process! If these files are not available, there is little else you can do but recreate them. Be sure to select the right authoring tool based on your desired outcome. Each has its own strengths and weaknesses, which instructional design experts will understand in order to select the right tool for the job. The conversion will also require a certain amount of testing to ensure that the converted course has an effective user interface. Once the course has met performance benchmarks, it will be ready to publish in HTML5. Rebuilding the Course: If you have decided that you don’t have enough of the original files to recreate the course, or that this is a good opportunity to update the course, you can choose to rebuild. This process is more intensive, and absolutely requires a talented instructional designer or custom course development service to help you. Rebuilding a course equates to starting from scratch; it means creating a storyboard. You can decide together what elements of the old course can be kept and what needs to be added or created. Images can be replaced by similar and more modern images found online. If there are no source files, audio and video would need to be recreated. Flash did provide an advantage when it came to animations; they can’t always be recreated the same way in authoring tools. However, a video can be an effective alternative if the animations are vital to the training. If it’s not vital to the training, it’s an opportunity to slim down the course to its most effective elements. What Does Flash Conversion Involve? Depending on whether the course is built entirely using Flash or just has some smaller Flash elements, the process may be slightly different, especially depending on whether or not you have the original source files. Regardless, most companies will have hundreds if not thousands of hours’ worth of course material that will need to be converted. Because training departments also have to keep up with the current demand placed on them, we highly recommend hiring an instructional designer or development team to do the conversion for you. The cost of hiring someone to convert the course can start at around $500 per course, and there is very little time commitment on the client’s end besides handing over the files. As previously mentioned, Flash has been on a downward spiral for years due to certain disadvantages that plague the format. These disadvantages caused Apple to ban it from the iPhone, and developers slowly turned toward other alternatives. The benefits of alternatives like HTML5 often apply to those developing an elearning course. Has Better Security: Flash is the original, which also makes it less thoughtfully designed in regards to security issues. It has a lot of loopholes which cyber attackers have exploited in the past. As recent as 2017, over 60 security vulnerabilities of Flash were identified, allowing attackers to swipe login data, passwords, credit card numbers, and more from encrypted systems. This is no good for your customers, and also leaves your elearning courses and other data vulnerable. Is More Mobile-Responsive: Flash isn’t even supported on iOS devices. It also doesn’t support a touchscreen interface very well, which doesn’t bode well in a touchscreen-driven world. It takes a lot of energy to run and often causes mobile systems to crash. Is Compatible with All Browsers: Flash will no longer be supported on Google Chrome, and is turned off by default on Safari. Microsoft Edge also has Flash disabled and asks for permission every time a user chooses to use Flash. Has Better Performance: HTML5 runs 58% faster on Linux and Mac OS X. This is due to the weight of graphics processing. Will Continue to be Updated: Flash is no longer being updated as of 2020 and will stop being distributed. Thus, security concerns will exponentially multiply the longer the software is neglected. HTML5 doesn’t face such a problem. Converting courses once the updates are already stopped will be a tedious, difficult task. 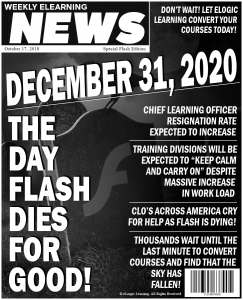 It’s scary to think that Flash- which the elearning industry has relied on for so long- will no longer be available to us. But it’s also a great opportunity to update content and create modules that will perform better for learners. If you have any questions about the conversion, feel free to reach out and see how we can help meet your conversion needs.